Nāgasena was a Buddhist sage who lived about 150 BCE. 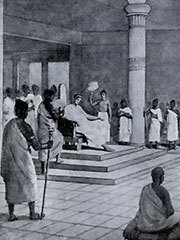 His answers to questions about Buddhism posed by Menander I (Pali: Milinda), the Indo-Greek king of northwertern India, are recorded in the Milinda Pañha. There is almost universal agreement that this text was later expanded by numerous other authors, following the «Question and Answer» pattern established in the early books. The version extant today is very long, and has signs of inconsistent authorship in the later volumes. There is no agreed-upon point at which Nagasena’s authorship may be said to end (and the work of other hands begins), nor has this been perceived as an inherently important distinction by monastic schoars. Other personalities mentioned in the text are Nāgasena’s father Soñuttara, his teachers Rohaa, Assagutta of Vattaniya and another teacher named Āyupāla from Sankheyya near Sāgala. There is an Indo-Chinese tradition that Nagasena brought to Thailand the first representation of the Buddha, the Emerald Buddha. According to this legend, the Emerald Buddha would have been created in India in 43 BCE by Nagasena in the city of Pataliputra (today Patna). Nagasena is not known through other sources besides the Milinda Panha and this Indo-Chinese legend.